The Chief of Plastic and Reconstructive Surgery at Memorial Sloane Kettering Hospital was a personal friend, doing most of his work in breast reconstruction. With his supervision and the help of some generous physical therapists who shared their rehab exercises with me, I developed fitness training guidelines for post-operative breast surgery. In the early 1990s there was a scarcity of interest, research, funding or support available to breast cancer survivors for improving their fitness and well-being. Cosmetic and fashion industries hadn’t woken up to the call. However, the grass roots support group SHARE in NYC was at the ready. After a thorough screening by their gate-keepers, I began creating and delivering fitness programs to their members, who were eager for help. It made sense to me that simple exercises could help a woman improve her function and quality of life after surgery, chemo and radiation. We could begin by relaxing the tight areas, relieving pain and stiffness, then increase range of motion to improve posture and alignment, and gradually move forward to condition the muscles. 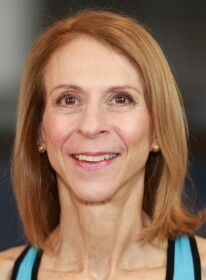 In my work with post-mastectomy clients, a common complaint is that they are given a long list of things to avoid in exercise, but few guidelines as to what they can do. The normal progression is to begin to increase cardiovascular stamina slowly and steadily by walking daily, building up to 30 minutes most days of the week. With your doctor’s permission, start doing stretching to increase arm and shoulder flexibility. Once pain free range of motion has been restored and the wound is healed, you can begin gentle strengthening exercises. New research is challenging old thinking about preventing lymphedema, a possible side effect of breast cancer treatments. The new study shows that strength training exercises actually reduce the risk of developing this unwelcome complication, improve symptoms if they develop, and prepare women to return to their normal day-to-day activities. Traditionally, women have been advised against lifting anything heavier than 5-15 pounds and performing repetitive arm movements like scrubbing, pushing and pulling. While some women altered their lifestyles out of fear of triggering an episode, many others were not able to abide by the old restrictions because of their normal physical demands such as picking up a child, carrying a laptop, or doing housework. A study published the New England Journal of Medicine compared the effects of strength training on 141 breast cancer survivors who had lymphedema, a painful swelling of the arm. Half of them were told to continue doing any type of exercise that they normally did. The other half engaged in a gradual, progressive program of weight lifting. The surprising results were that the weight lifters had significantly fewer flare-ups than the control group. The weight lifters had fewer problems because they had better muscle tone and endurance. The program of progressive weightlifting exercises gradually increased the physical capacity of the affected arm in a controlled setting, making it less likely that daily activities that require upper body strength would overstress the impaired lymphatic system. In the study, the women worked out twice a week for one year. Fitness professionals established the proper starting weight for each participant based on her current level of strength and added more weight gradually every two weeks, provided there was no change in her symptoms. All the women wore a compression sleeve around the limb at risk and were monitored periodically by a lymphedema specialist. 1) Always check with your doctor before becoming much more physically active than you are now. 2) If you have lymphedema, talk with your doctor to make sure that your lymphedema is stable (i.e. you haven’t had new problems in the last three months). 3) Wear a custom-fitted compression sleeve while exercising. 4) Consult with a certified exercise professional regarding proper weight lifting techniques. 5) Start slowly and progress gradually. Stop if you have pain, increased swelling or discomfort. 6) In the event of a flare up, have an evaluation by a lymphedema specialist and wait until the flare subsides before resuming lifting. How we have advanced in the past 30 years! Not only do we know so much more about how exercise can benefit breast cancer survivors, but research now shows how we can prevent it. As we become more aware of the role that exercise plays in managing our risk factors for developing breast cancer and/or preventing a recurrence, it becomes apparent that being active is one of the top ways to avoid this disease. Active women have a lower risk, tolerate treatment better and may reduce their risk of recurrence of breast cancer. Hundreds of studies show that getting exercise and avoiding weight gain can lower your risk of developing breast cancer. Most studies see a benefit at 30 minutes of walking a day. One large study by the American Cancer Society study tracked 72,000 postmenopausal women for 5 years and found that the most active women – those who engaged in activities like walking, running, swimming, tennis, biking, aerobics and dancing- had a 29% lower risk of breast cancer than the least active. How is exercise protective? In postmenopausal women, since the ovaries are no longer producing estrogen, the main source of estrogen is fat cells. Reducing body weight and body fat with exercise decreases the amount of circulating estrogen that could stimulate breast-cell growth. Being heavy increases your risk by as much as 40%. One study showed that women who gained more than 20 pounds after age 18 had a higher risk of postmenopausal breast cancer than women who gained no more than 5 pounds. 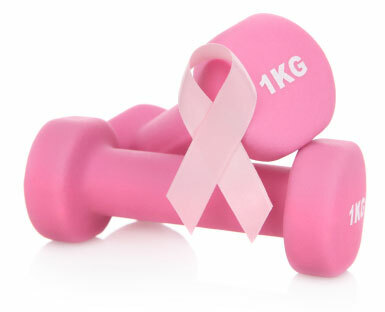 If you have been exercising and you do develop breast cancer, you will be better prepared to tolerate the treatments. It’s important to keep a positive mind set for getting through the treatment and think about living a healthy life afterward. You want to create a positive mental environment for your body where it will be nurtured and thrive. Are you aware of how little activity it takes to reduce your risk of breast cancer? More than 30 studies show that as few as three hours a week of moderate to vigorous physical activity can both reduce your risk for developing breast cancer and lower a chance of recurrence by as much as 40%. That’s a great return on an investment of about 30 minutes a day. You don’t have to join a gym, run a marathon or buy fancy equipment. Power walking is more than sufficient! Think “activity” instead of “workout.” Find opportunities to move. Minutes add up: Build activity into your day. If you can’t find 30 continuous minutes, just accumulate the total in smaller increments of 10- and 15-minute segments. Make every minute count – walk down the hall to speak with a colleague at work instead of emailing, walk or bike to work, use the stairs rather than the elevators. Put energy into every minute of movement. Add steps to your day: Step up your level of activity. A pedometer, app or tracking device provides a good reality check and can motivate you to higher numbers. Experts recommend a goal of 10,000 steps a day which may seem miles away from your personal reality; but another advantage of the pedometer is that you can set your own goals. See how many steps you’re currently accumulating during the course of your day and create a goal based on that. When you’ve reached the first goal, set another one, and continue to build, step by step. Tangible progress creates incentive and enhances self-esteem while you’re building physical stamina. The information in this article should not be construed as medical advice. It is not intended to replace consultation with your physician or healthcare provider.